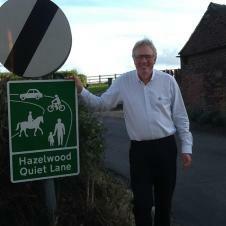 The Parish Council have completed discussions with Derbyshire County Council , to get the network of country lanes within Hazelwood designated as Quiet Lanes . This designation is now in force with new signs at each of the entry points to the village . Although the National Speed limit signs are still in place we are now requesting that all drivers operate using the voluntary 30mph speed limit agreed by the community . The Parish Council have already engaged with Lubrizol who are actively supporting and encourage their employees and suppliers to adhere to the new limit . This speed limit has been chosen to recognise the many recreational users and to help maintain safety for all . We have completed an initial review of traffic noise on the A517 in the Plains Lane area, which impacts on Parishioners resident along the A 517. We have also taken data from other points in the local area for comparison purposes . It is clear that the noise generated by certain vehicle types seems extreme , whether due to " whiplash " on trailers , impact with cats-eyes , road surface effects etc . We are presently considering how to package the data for presentation to DCC Highways , in order to stimulate their interest in the situation .